Foods service is very popular all around the world, especially is the outdoor food booth. it mainly location in street, bench or other downtown areas. the most popular service is the bakery, cupcake, and drinks. 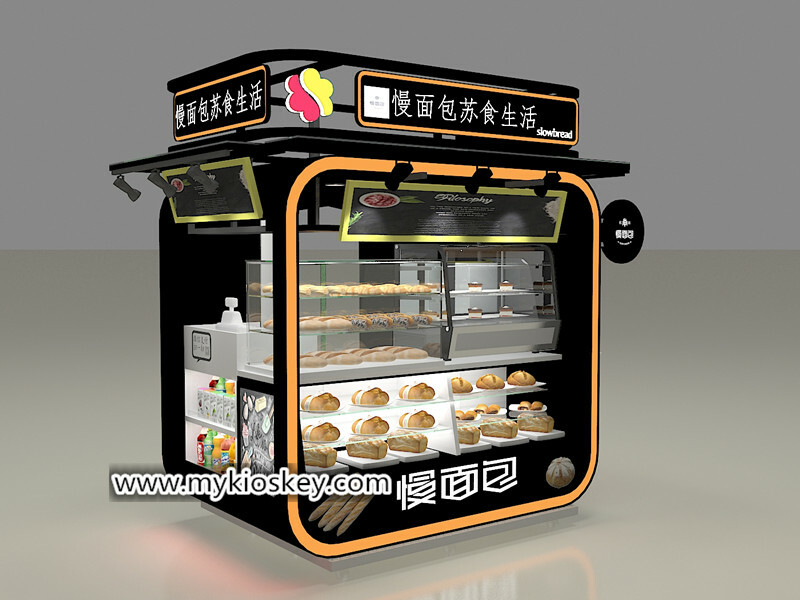 today what I wanna share is one of popular bakery display kiosk for your meet. As you see this kiosk mainly tone is black, match a little orange and white, is 2200X1500MM, 2550mm height. it can for selling bakery and juice. same as almost outdoor food kiosk , the whole kiosk can be closed when at night, the backsides with a small entrance door. whole kiosk two sides with display windows. 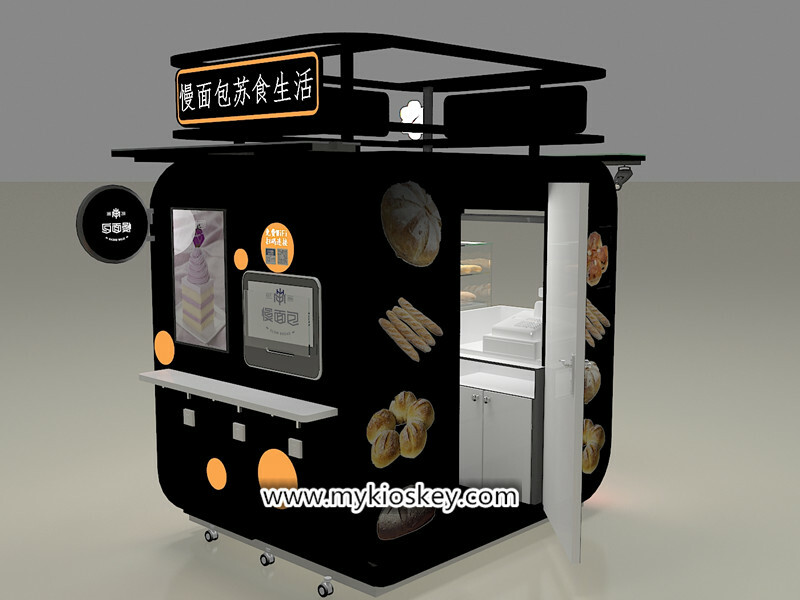 the front part with two big bakery display fridge, the left sides mainly for order and cashier. the right sides of this kiosk with a small bar counter with bar chair, it’s very comfortable for the customer seating area. the entrance is the backsides. 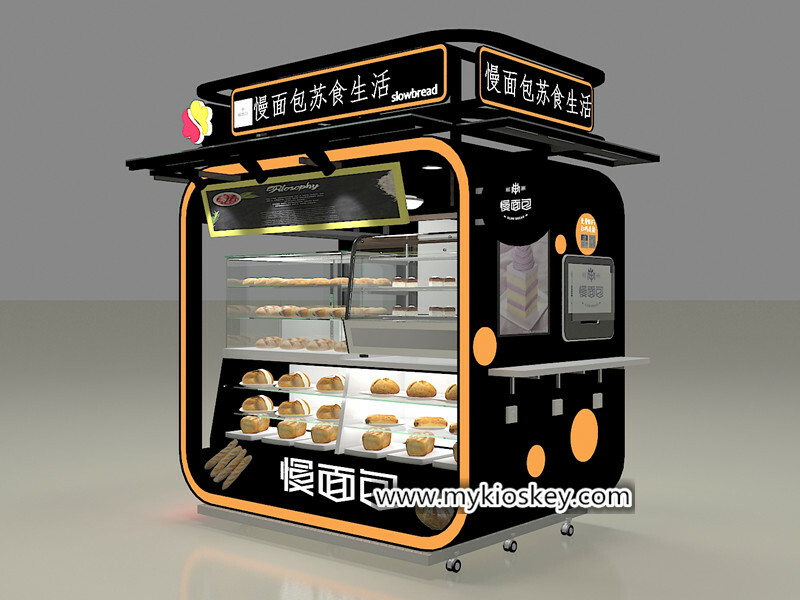 You will notice this kiosk surface with many bakery posters, three sides with luminescence acrylic logo, the bottom of this kiosk with many wheels, it’s easy to the moved whole kiosk. Thanks for your time and reading, if you wanna know further info or interested start an outdoor food booth like this one, Unique is a direct manufacturer mainly do customize and design for different kinds of food booth or retail kiosk . just share your ideas, we can make it come true.